Earlier this year we visited family in Sydney. We love spending time with our grandchildren but we also love going out to see various places around Sydney on days when the children are not home. One of the places we love visiting is the Ku-ring-gai Wildflower Gardens just off Mona Vale Road in St Ives in the northern parts of the city. We have visited on quite a number of occasions and it is only about a half hour drive from my son’s home. On the last occasion we visited – just after Easter – we took a picnic lunch with us and ate in one of the designated picnic areas as shown in the photo above. There are several other picnic areas in the gardens. The term ‘gardens’ is a little bit of a misnomer. 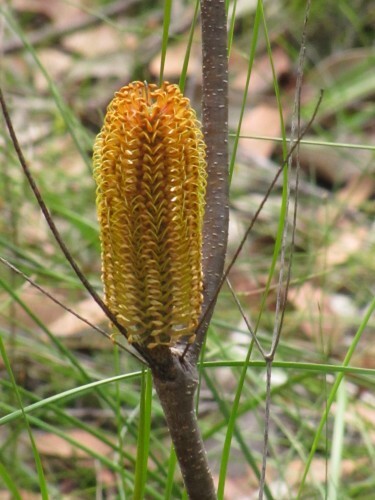 Sure, the local council and a friends group as well as other interest groups such as the Australian Plants Society have been busy planting and maintaining sections where visitors can see some of our wonderful Australian native plants. 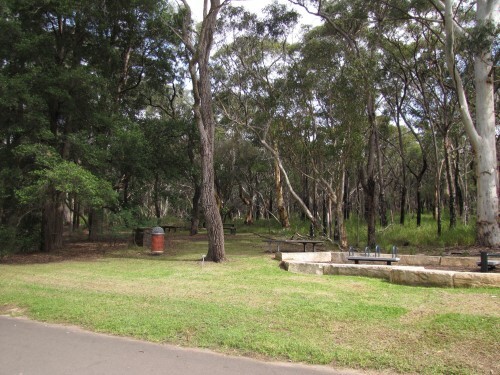 The vast majority of the ‘gardens’ is actually uncleared natural bushland boasting a great range of local plants. There are many good paths leading through interesting sections of the gardens, some of them suitable for wheelchairs. In coming days I will share a few more photos I took on this recent visit. A spectacular Australian plant in a huge field of spectacular plants would have to be the Chamelaucium group of native plants, two of them shown here. When not in flower they are a nondescript plant, but when they burst into flower the colours can be almost overwhelming. These photos were taken of several bushes in the Pangarinda Arboretum near Wellington in South Australia earlier this year. In a huge collection of wonderful plants it is hard to stand out from the crowd, but this species certainly does, especially on a dull winter’s day like our last visit. You can see more flowers and plants from this collection in recent posts here on this site, and there is more to come in the next few weeks. My wife and I both enjoy seeing the various species of Eremophila plants in flower. Eremophilas – commonly called Emu Bushes – are found in many parts of Australia and especially in the drier inland regions. They are becoming a very popular garden plant too, mainly for their wonderful show of colourful flowers over many months. 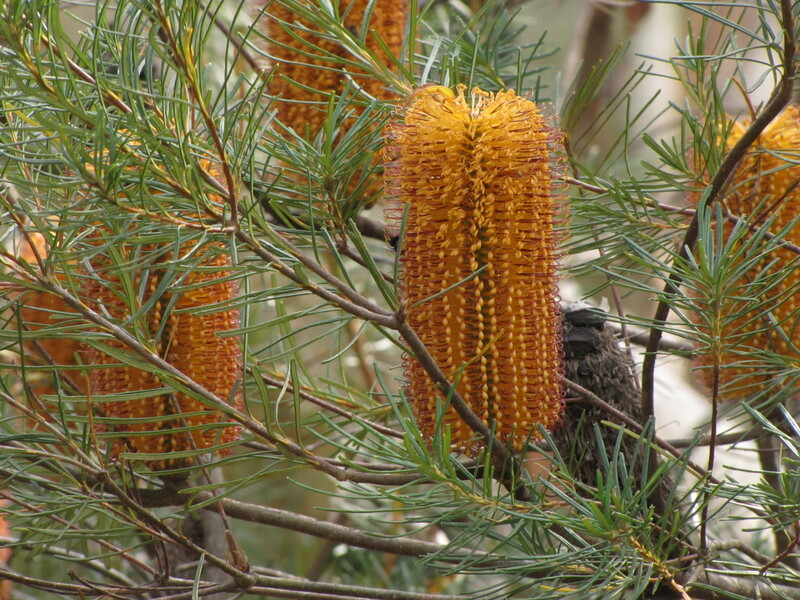 They also attract many of our nectivorous birds like honeyeaters. This series of photographs was taken earlier this year at the Pangarinda Arboretum at Wellington, South Australia. This is just over an hour’s drive south east of Adelaide. I’ve featured this special collection of plants and flowers over recent days here on this site, so look back through recent posts for more beautiful flowers. Australian native plants display an amazing variety of colours and shapes. One of our favourite gardens we like to visit on a regular basis is the Pangarinda arboretum at Wellington on the River Murray in South Australia. It is only a half hour drive from our home so we are frequent visitors. 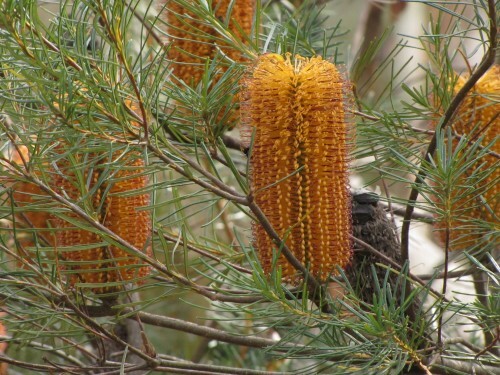 This huge collection of Australian native plants has been planted and is maintained by an enthusiastic group of local people on land provided by the local council. It is open to the public every day at all hours through an unlocked gate. Note: please shut the gate after walking or driving through. This is to keep the local rabbit population out, which helps the plants to thrive. Over recent days I have been showcasing photos of flowers taken on my most recent visit a few weeks ago. I’ll show more over the coming days.